Prince Nicolas of San Cecilio is set to marry the girl of his dreams, a commoner named Brittany, even though Princess Rosalind of Mondovia had for many years been the girl he was to wed. Princess Rosalind is obviously upset and even more so when she finds out that she is to spend some time at San Cecilio, helping Britt learn to become a princess. Surprisingly, the two girls do become friends of a sort. When Princess Rosalind, aka Rose, escapes the castle for a few hours and pretends to be a normal girl visiting a bookshop, she meets the most handsome man she has ever set eyes on and is immediately drawn to him. Zachary is also taken with Rose and the two spend an enchanted afternoon together, knowing they will probably never see each other again. Rosalind has no choice but to hurry back and fulfill her princess duties. 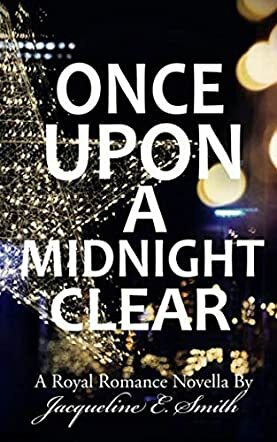 The surprises and events that follow make Once Upon A Midnight Clear the wonderful story it is and you must read it to learn of the Christmas magic and the royal wedding. Once Upon A Midnight Clear by Jacqueline E. Smith is a sweet and loving 'happily ever after' princess story and the fact that it takes place during the Christmas season makes it even more fun. I was caught up from the first word right until the very last. I found Once Upon A Midnight Clear to be a real life fairy tale story that was perfect in every way. Jacqueline E. Smith is a brilliant romance author and I can only hope that there will be a followup book. There is all the magic of Christmas, the excitement of a royal wedding and characters that are impossible not to like. Please, please do not pass this up if you can’t resist a love story taking place in a charming setting. It doesn’t have to be the Christmas season for you to enjoy this lovely romance.